Cumberland Academy of Georgia, an Atlanta-based special needs school, and LexisNexis Risk Solutions, have worked together on many projects which enhanced the schools’ facilities. This week, the corporate partnership morphed into an educational partnership through a newly developed seminar. LexisNexis Risk Solutions developed the seminar for young adults and with strong Math and Computer Science skills. 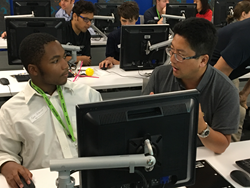 This two-day coding and career seminar was offered to both Cumberland alumni and current high school students. Originally tested in Florida, LexisNexis Risk Solutions wanted to test it in Georgia, and Cumberland was the school chosen to be first recipient. On the first day, the seminar began with a presentation from Scarborough to the employees and volunteer mentors from LexisNexis Risk Solutions. She discussed Autism Spectrum Disorder and how to work with a co-worker who has ASD. In addition, she explained different strategies taught at Cumberland that help students in their academic endeavors. She offered explanations for why students appear agitated in certain circumstances (i.e. students with sensory issues may dislike the sound of the air conditioning, etc). Steven Scarborough, Scarborough’s son, gave a presentation on what it’s like to have ASD. After the presentation, students were given a brief overview of the coding project and paired with an individual mentor from LexisNexis Risk Solutions. Together, they worked on coding skills using ECL coding language which is a specific coding language developed for use with the company’s high performance computing platform, HPCC Systems. After a day of coding, the students and their mentors presented their findings to the group. Two students were given special awards for their efforts, and all students received a certificate of coding experience. During day two of the seminar, the students were given a tour of the LexisNexis Risk Solutions data center and a description of the scope of work at the company. After, Cumberland students were paired with a different mentor. This individual taught their mentee how to build their resume and how to prepare for interviews. This included what managers are looking for and how to sell yourself as a great employee during an interview. Towards the end of the day, students participated in mock interviews. The managers made suggestions so students would be able to interview and present their resumes and themselves in the best way possible. Cumberland Academy of Georgia specializes in the needs of students in grades 4 through 12 who have high-functioning autism, Asperger’s syndrome, attention deficit disorder (ADD), attention deficit hyperactivity disorder (ADHD) and learning disabilities. Cumberland was founded in 2007 by Debbi and Matthew Scarborough, and is a fully-accredited, independent, non-profit school that seeks to provide a safe and supportive academic atmosphere for its students. Cumberland accepts applications year-round. To schedule a family tour, please contact Terri Brooks, Director of Admissions, at 404-835-9000, or email admissions(at)cumberlandacademy(dot)org. LexisNexis Risk Solutions harnesses the power of data and advanced analytics to provide insights that help businesses and governmental entities reduce risk and improve decisions to benefit people around the globe. We provide data and technology solutions for a wide range of industries including insurance, financial services, healthcare and government. Headquartered in metro Atlanta, Georgia, we have offices throughout the world and are part of RELX Group (LSE: REL/NYSE: RELX), a global provider of information and analytics for professional and business customers across industries. RELX is a FTSE 100 company and is based in London. For more information, please visit http://www.risk.lexisnexis.com and http://www.relx.com.